Supernovae (SNe) are the deaths of stars big and small. Like many older fields of astronomy, the study of supernovae is plagued with dated nomenclature which is largely unrelated to the physics driving these dazzling events. Below is an enumeration of many known supernova subtypes and simple guidelines for classification. These classifications will rely on your knowledge of spectra, so we recommend reading our spectroscopy guide first! Type Ia: Type Ia supernovae are the most famous type for two reasons: we find them most often, and they can be used to study cosmology. The latter is true due to their striking lack of diversity. The shape of their light curves (the luminosity of the supernovae as a function of time) can be used to measure their maximum luminosity. This means that Type Ia SNe can be used as standard candles to measure distances. Ironically, the origin of these explosions is still uncertain. Type Ia supernovae are likely caused by the thermonuclear explosions of white dwarf stars; however,it’s currently unclear if these explosions are from single white dwarfs or merging white dwarf binaries. In our simple classification, Type Ia supernovae lack hydrogen and have a strong silicon absorption line near its maximum luminosity. Type Ib: Type Ib supernovae are formed when a massive star collapses under its own gravity. This star must have its outer envelope of hydrogen stripped away, because we observe no hydrogen in these spectra of these objects. However, we do observe the second ‘onion layer’ of helium. Type Ic: Type Ic supernovae are also formed when a massive star collapses under its own gravity. The stars that produce these supernovae have both their hydrogen and helium layers stripped away over the course of their lives. Because of this, we do not see hydrogen or helium in the spectra of Type Ic SNe. Type Ic – Broad Lined (Type Ic – BL): Some Type Ic supernovae have very broad lines (a speed of 20,000 km/s for the bulk of the material!) compared to normal Type Ic SNe. As you might expect, these supernovae typically have higher kinetic energies than normal Ic SNe as well. The origin of the increased energy is unclear and a highly debated topic. GRB-SNe: Some Type Ic – BL supernovae are associated with another transient phenomenon: gamma-ray bursts. These events have been interpreted as the collapse of a massive star with the formation of a jet pointed in our direction. It’s possible that all Type Ic – BL SNe are associated with GRBs and some are just not pointed towards us, but we’re not sure yet! Superluminous Supernovae (Type I/II SLSNe): A subset of all supernovae are found to be 100 times or brighter than most supernovae. This class is therefore called “superluminous supernovae” — clever, right? 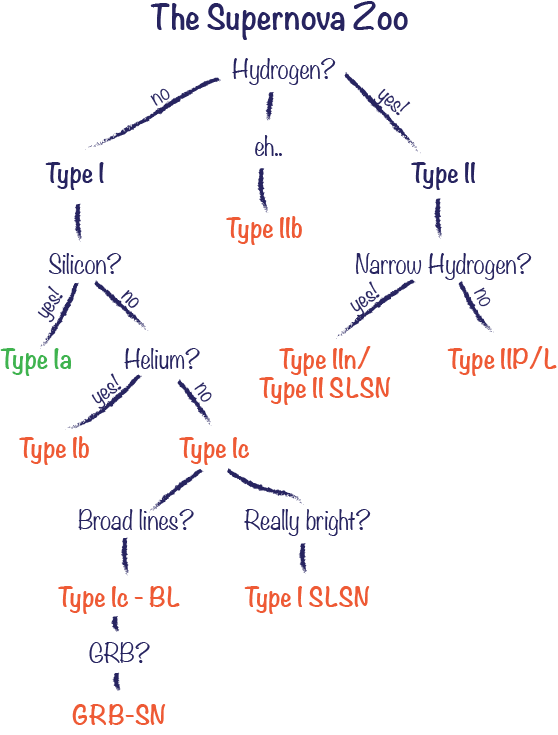 SLSNe are, like normal SNe, divided into Type I (lacking hydrogen) and Type II (showing hydrogen). Type II SLSNe are typically spectroscopically similar to Type IIn SNe (see below), so they might be extreme versions of the same explosions. However, the mechanics behind Type I SLSNe is highly debated. Type IIn: Type IIn supernovae have very narrow (or slow) hydrogen lines in their spectra, superimposed on the typical broad lines. These narrow lines are interpreted as hydrogen which was blown off of the star before it exploded. To support this argument, a few of these Type IIn supernovae, like SN 2009ip, have had extreme outbursts before their final explosion. Type IIP/II L: Type IIP/IIL contain relatively broad hydrogen lines. These explosions are thought to be the deaths of red supergiant stars, which are enshrined by their hydrogen envelopes. The light curves of Type IIP and Type IIL supernovae have distinctive shapes, with a long plateau lasting for hundreds of days. Type IIb: Type IIb supernovae largely break our classification system, but we have included them to give you a glimpse of how funky this business is. Spectra of Type IIb SNe begin with strong hydrogen lines, putting them in the Type II category. However, at late times they lose this hydrogen emission and instead resemble Type Ib SNe (with helium features). These explosions are likely from stars which have lost part of their hydrogen envelopes. Below is a visual guide to classifying supernovae. To be clear: the real classifications of supernovae are a challenging business, and require a complex ruleset. This is especially true as the subclasses become more specialized. In the below image, for example, it is entirely possible for a SLSN to be associated with a long GRB, or a Type Ia to be cloaked in hydrogen. Unless I’m mistaken, the ‘Yes’ and ‘No’ are interchanged in the tree diagram. Regardless, this post is a useful reference, so thanks for that. What would be the best supernova to ahieve this?